Prominent manufacturers of automotive compact camera module are capitalizing on popularity of the wide angle lenses. Many OEMs are exploring safety solutions constantly that could capture blind spots. Collaboration between manufacturers and investment in development of new compact camera module technologies will remain key strategies among companies in the global automotive compact camera module market. A new Transparency Market Research’s report profiles key players significantly contributing to the market growth, which include BYD Microelectronics, Toshiba, Xiaomi, Volvo, Mobileye, Huawei, Continental AG, AGC, Ability Opto, and Automotive Compact Camera. 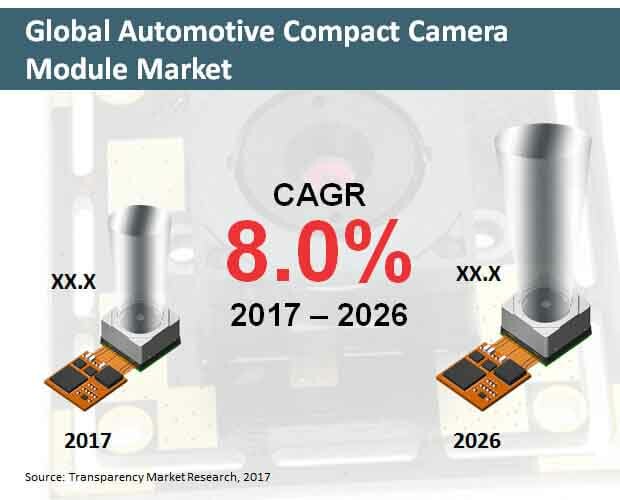 The report has slated the global market for automotive compact camera module to register an impressive single-digit expansion throughout the forecast period (2017-2026). Automotive compact camera module sales across the globe are estimated to account for over US$ 4,500 Mn revenues by 2026-end. Compact camera modules have been employed in vehicles for a wide range of applications over the past few years, particularly in passenger cars. These cameras, installed in rear, front, and inside of automobiles, provide safety to driver and passengers, meanwhile imparting an enhanced driving experience by improving front and rear view of the driver. Compact camera module-based automotive systems have undergone huge developments over the past couple of years, coupled with accelerated sales of compact camera modules for parking surround view. Rise in advancements in compact camera modules along with rapid production rate have resulted into declined costs of these cameras, which in turn has propelled their adoption. Mounting demand for sensing compact camera modules, which seek huge application in the advanced driver assistance systems (ADAS), along with rising concentration on safety measures owing to growing number of road accidents will augment the market growth. Considerable evolution has been witnessed in automotive compact camera modules, enabling their integration with safety systems. For instance, video camera technology is leveraged by lane departure system, along with electrically-powered steering, in order to enable faster feedbacks in critical conditions such as vehicle swaying away from the active lane. Automotive manufacturers are increasingly focusing on employing compact camera modules as substitutes for side view mirrors, which in turn will influence the market expansion in the near future. Rapid growth in industrialization along with robust automobile production in countries such as China, India, and South Korea, are expected to influence the market for automotive compact camera module in Asia-Pacific excluding Japan (APEJ). Nearly one-third revenue share of the market has been projected to be accounted by sales of automotive compact camera modules in APEJ. The region will continue to be the most lucrative market for automotive compact camera module, followed by Europe and North America. However, sales of automotive compact camera modules in North America will continue to witness a relative faster expansion than those in Europe through 2026. Automotive compact camera modules with pixel size of 720p to 1080p will remain sought-after among customers in the market. Revenues from this pixel size segment will remain significantly higher than those from less than 720p and more than 1080p (upto 4K) combined. However, sales of automotive compact camera modules with pixel size of more than 1080p (upto 4K) will register the highest CAGR through 2026. Luxury passenger cars will remain the most remunerative vehicles in the global automotive compact camera module market, followed by premium passenger cars. However, sales of automotive compact camera modules are slated to register the fastest expansion in heavy commercial vehicles, closely trailed by compact passenger cars, through 2026. Based on application, LDWS (lane departure warning system) was more lucrative in the market than FCW (forward collision warning system). However, the latter is projected to outgrow the former in terms of revenues by 2026-end. Head-up displays will continue to be the largest application of automotive compact camera modules.